Here is a very good and helpful article about skiing the Wright Peak Ski Trail, one of my favorite backcountry ski trips. This is not to be mistaken with skiing on the Wright Peak Slides, otherwise known as Angel Slides, which I do not recommend. The lucky author takes part in a guided backcountry ski trip led by my favorite telemark ski mentor and Idem sailboat restorer, Jim Sausville. Jim is such a great skier, teacher, and an overall nice person that he is the only person in the world who can get away with calling me "Jo-animal," while skiing. 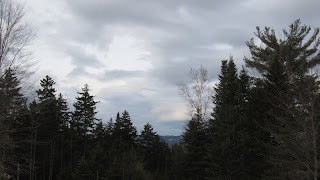 Today's featured photo is the view from home this morning, which looks quite different without my favorite balsam.